Taken from the national website, below is Vivienne McGhee’s September update. To leave comments for Vivienne go to the original page here. Click the photos to enlarge them. August has been a quieter month for me in that I have been at home most of the time. Unfortunately that did not mean a lot of gardening as there was so much rain of the torrential nature. I quite enjoy gardening in light or intermittent rain but I find no joy in becoming drenched in downpours. So I have spent more time than usual sitting in the gazebo that looks over the larger pond in the garden – sounds grander than the reality. Nevertheless it is a pleasant place to sit with a choice of looking at the quiet green of lawn and hedge with trees beyond or across the main borders near the house. Whilst engaged in the gazebo I became fascinated with the bee activity on nearby Aster divaricatus. 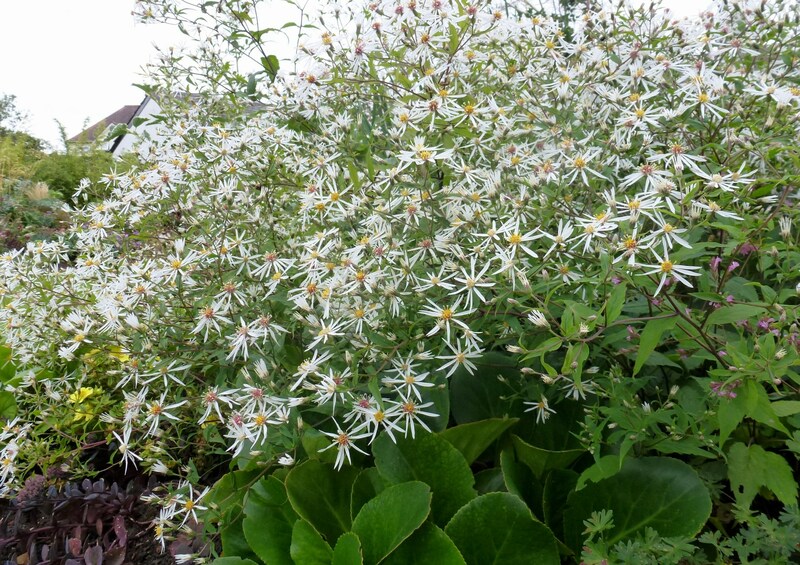 I think that this is a superb plant with its wiry nearly black stems and profusion of white stars with golden centres. It does flop a bit but I do not stake it as that destroys its relaxed nature. So I follow the advice of Gertrude Jekyll and Graham Stuart Thomas and plant bergenias in front. The begenias are not adversely affected by being flopped over and also give a lovely solid shiny contrast to the “fluff” of the aster. The bees are on it as soon as the rain stops. I wonder where they shelter nearby? Talking of bees, I did have one trip away from home this month – to the Society’s study day “Stars of Late Summer” hosted by the Southern Counties Group. 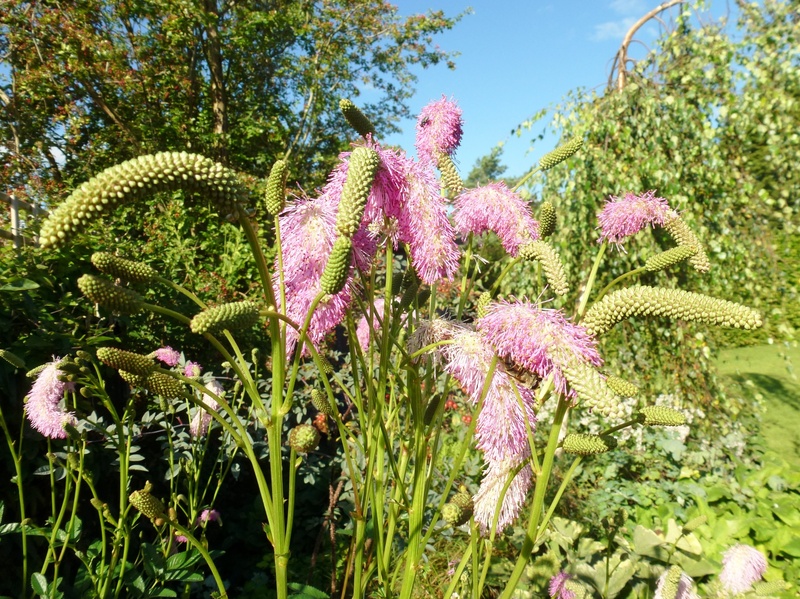 Sanguisorbas were one of the families of plants featured during the talks and the visit to Sussex Prairies Garden. 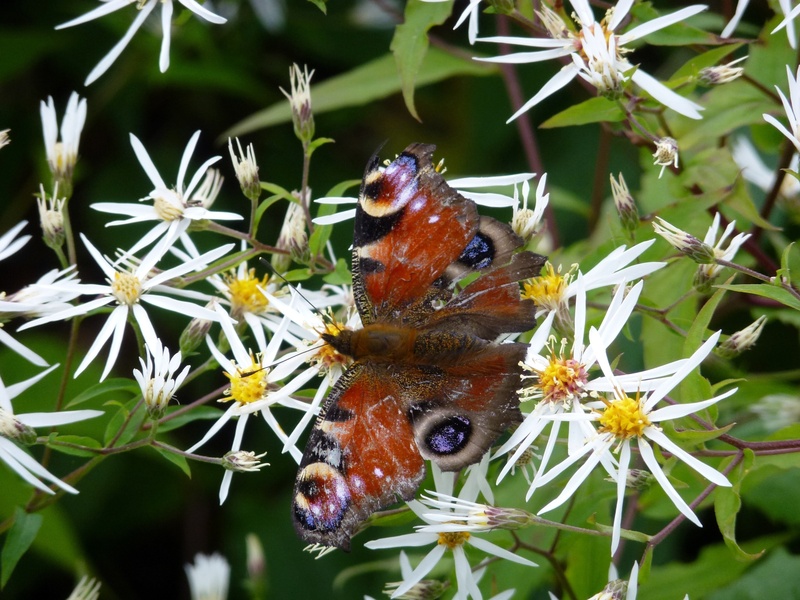 In particular Marina Christopher drew our attention to the various pollinating insect for the species. Did you know that the ones with red flower heads are pollinated by flies whilst those with fluffy pinkish ones one are pollinated by bees. So back in my garden and on a round of sanguisorbas – she is right! You probably knew that all along, so please forgive my moments of excitement. I love planning and often pick up ideas when visiting other people’s gardens. I came back from Sussex Prairies with the idea of sculpting the hornbeam hedge allowing 3 of the trunks to grow up as trees and adding Helianthus ‘Lemon Queen’ to grow behind. Now sitting in the gazebo looking at my “green” aspect I am not sure. This requires further thought and dreaming. My plans do not always come to fruition but the dreaming is enjoyable. Posted on September 17, 2012, in National Chairman's Blog, News 2012 and tagged climate, graham stuart thomas, nature. Bookmark the permalink. Leave a comment.